Figure 3 shows two things very clearly. First, carbon dioxide concentration is rising, and will continue to rise, in a more or less straight line; secondly, there is no correlation, and hence necessarily no causative connection, between carbon dioxide concentration and global temperature. Not correlated? How do we know? All I see are two increasing trends, that may or may not be correlated. Of course since temperature and CO2 are in different units isn’t it possible to scale the y-axis of the CO2 graph differently to make both trends match up visually? Or to make the increase in temperature seem more rapid than the increase in CO2? Yes both are completely possible. 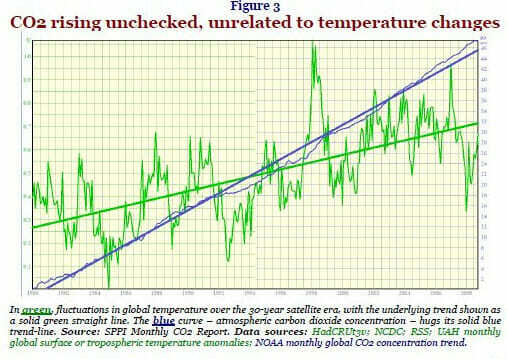 In fact Monckton’s entire statistical analysis consists of nothing more than a scaling the y-axis to ensure that the temperature and CO2 trends are visually distinct. It is nothing more than a cheap visual trick to attempt to fool the naive. It doesn’t stand up to even the most basic scrutiny.